Howard Hawks's stirring tale of a fledgling airmail service that traverses the Andes from a strip in a South American banana port is the ultimate workplace dramedy. Hawks weaves brawny romance and humor and a man's-man sort of heartbreak into his tribute to the ideal of vocation. The risky job of lifting mail over and through the mountains becomes a crucible of character, group feeling, and sexual loyalty. 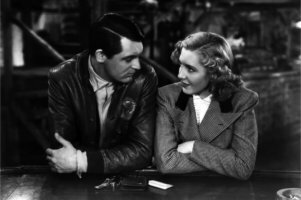 Cary Grant delivers a robust, carnal performance as the flyboys' boss, and Jean Arthur is skittishly charming as an entertainer waiting for a boat out of town; Grant emits an electric charge when he starts to take her seriously. Hawks surrounds these two actors with a jaunty ensemble, including the impossibly pretty young Rita Hayworth, as Grant's prior flame, and the cagey Thomas Mitchell, as his best friend and right-hand man. As Hayworth's husband, a top aviator with a tainted past, Richard Barthelmess is haunted and moving. The script is by Jules Furthman, an ace in his own right. Inspired by Hawks' observations of real plane accidents and set in the fictional tropical town of Barranca, Only Angels Have Wings is about the exploits of a private airmail company that flies mail over the Andes. Said company is helmed by the all-business Geoff Carter, played by the inimitable Cary Grant in an ostentatious white linen suit and a preposterous straw hat and bandolier. Despite his cowboy on vacation stylings, Grant plays Carter to perfection, spitting out cocky one liners and sarcastic affection to all and sundry. This was during a period that was noted as Grant's heyday, and it's easy to see why he was such a certified star. He simply oozes charisma, and interactions between him and others are whip smart. That said, it isn't simply Grant's vehicle. Thomas Mitchell's Kid Dabb is a grounded veteran who plays the role of the crew's adoptive father, Jean Arthur plays a wayward chorus girl who becomes romantically involved with the stalwart Carter, and the luminous Rita Hayworth makes her first experience on screen as Judy McPherson. Judy is Carter's old flame, and is married to Bat McPherson, a pilot known for a cowardly and selfish parachute jump which caused the death of one of Carter's pilots' brother. Friction and verbal sparring abound, and bar a slightly dubious accent from Duchy, the dialogue is excellent. There's a slight stilted quality at times which is symptomatic of the era, but other than that slight blemish it's refreshingly sharp and witty despite its age, and modern star vehicles could do well to learn from the past, with the female cast giving as good as they get and being far more than eye candy. Beyond the actors' brilliant performances, the economy of the set work is to be admired too, with minimal locations conveying a great sense of place. A special tip of the hat to Tex's mountain outpost set, a sterling effort that helps add a sense of spatial context to the flying sequences. The model work involved in these is the only real relic here. The stunt flying shown is thrilling and orchestrated wonderfully with the on the ground sequences. Radio exchanges between pilots and control are evocative and tense in a way that belies the economy of a pre-CGI world. After 75 years, it's still a brilliant exercise in plotting, drama, comedy and action with a fitting denouement. It's the perfect Hollywood recipe executed by a director whose prowess hasn't been overshadowed by decades of iteration on the classic model. There are plenty of lessons in pathos and direction that modern Hollywood could take inspiration from, and Only Angels Have Wings vehemently proves that the oldies are still absolutely golden. - Luke Shaw, Eye For Film, 14 May 2015. This digital transfer was created in 4K resolution on an Oxberry wetgate film scanner from the original 35mm camera negative, and restored by Sony Pictures Home Entertainment. Restoration was done using MIT's DRS at MTI Film in Hollywood, California. The original monaural soundtrack was remastered at 24-bit from the original 35mm soundtrack negative at Chase Audio by Deluxe in Burbank, California. Transfer supervisor: Grover Crisp/Sony Pictures Home Entertainment, Culver City, CA. Colorist: David Bernstein/Deluxe, Burbank, CA. The unique balance between light and shadow is wonderfully managed and the film's delicate visual style is now that much more impressive. The wide range of nuanced blacks - an essential element of the stylistic appearance favored by Howard Hawks - are especially impressive, as key sections from the film are quite dark. The grain is very light and wonderfully distributed and resolved, as it should be after a high-quality 4K scan. There are no traces of compromising sharpening adjustments. Image stability is excellent - transitions are never shaky or jittery and there is no distracting edge flicker. Lastly, large debris, cuts, damage marks, stains and other age-related imperfections have been carefully removed without affecting the integrity of the film. - adapted from Dr Svet Atanasov, BluRay.com. April 18, 2016.